EasyCut Studio is excited to launch Easy Cut Studio version 4.1.0.6, an intuitive and user-friendly cutting plotter application that aims to offer you all the necessary tools in creating vinyl letterings, decals, and general signs that you can cut using your vinyl plotters. It is that easy! 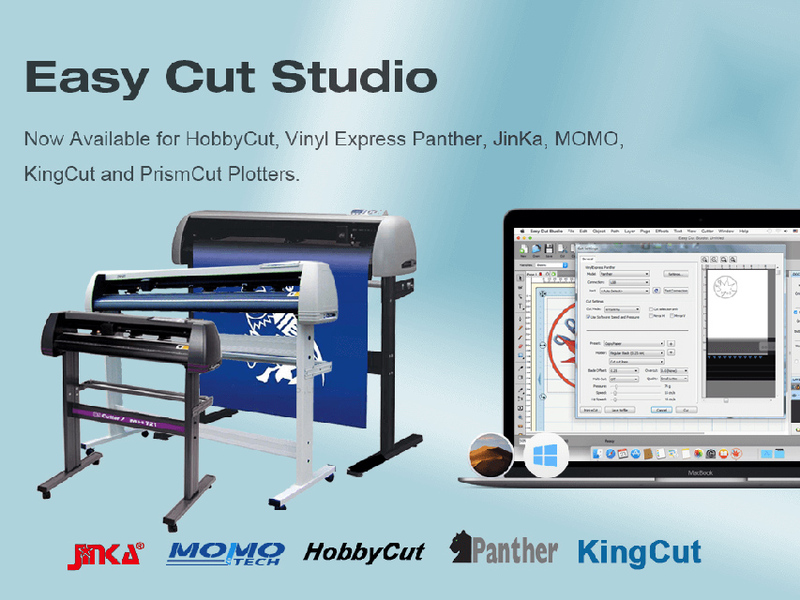 The latest version 4.1.0.6 of Easy Cut Studio provides support for more than sixty different vinyl cutting plotters including HobbyCut, JinKa, PrismCut, MOMO, KingCut, and Vinyl Express Panther cutting plotter. The both Mac and Windows version of software has been tested to work with these cutting machines above. In addition, the new version also fixed default baud rate setting for Refine and PixMax cutters. Easy Cut Studio brings all your vinyl cutting software needs into one simplified, easy to use program. Create text, shapes and freehand graphics at any size to cut in vinyl. It includes a more robust set of sign making tools such as image tracing, shadows, scanning, welding, text on arch, objects on path, node editor, Rhinestone, gradient fills, transparent fills, special effects and much more. All major cutting plotters are supported. If you’re looking for an all-in-one design and cutting program for your vinyl cutter, then Easy Cut Studio is the industry leading go-to choice. Other stability improvements and small bugs fixed. To learn more about Easy Cut Studio 4.1.0.6, please visit https://www.easycutstudio.com/. Easy Cut Studio version 4.1.0.6 comes with Lifetime License at a starting price of $59.95 USD. This software is available for both macOS and Windows platforms. The upgrade is available to all current Easy Cut Studio users at no charge.